by Natalie Madorsky Elman, Ph.D. and Eileen Kennedy-Moore, Ph.D. 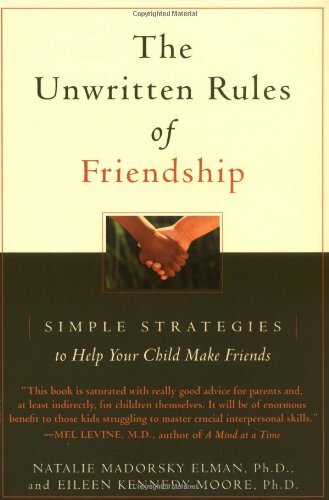 This book has a lot of great advice for parents who want to help their children make friends. It's broken down into 12 sections, with each section focusing on a particular personality trait or behavioral characteristic (e.g. “the shy child”, “the little adult”, “the sensitive soul”). You don't have to read the book cover to cover, just pick the sections that pertain to your child and dive in. One thing I like are the suggested activities included in each chapter. These are things you can do with your child to improve their ability to make connections with other kids. I also appreciate that the authors are very clear about not trying too many things at once and that change takes time. I love the emphasis on collaboration with schools and, in particular, with the main classroom teacher. It’s always good to know how your child looks and acts at school. Sometimes it’s quite different than how they behave at home! I only disagree with one recommendation they make: it is about dealing with bullying at school. They suggest that the bully and the bullied should conference weekly together with an adult. As a former school counselor, I would be very hesitant to suggest or implement this. If it is true bullying, there's an imbalance of power. A weekly meeting could make it seem like both parties are on equal footing, and might make the bullied kid feel like they’re responsible for the bullying. I would instead recommend separate meetings to work on their individual issues. Every other recommendation in this book makes a lot of sense to me. Overall, this book is a great resource for parents to help their kids make connections with others.